You can change many settings on S-Voice, the voice app that comes with your Galaxy S6. Rather than investigate all of them, take a look at a few key ones. The first of these examples changes the wake-up command. The default is “Hi, Galaxy.” Boring. You can change it to any phrase with four or more syllables. You may as well have some fun with this. S-Voice is your servant. You can name it anything, such as the name of your former gym teacher, a cheating partner, or the love of your life who got away. You get to call it what you want and tell it what to do. There is no one judging you (as long as they do not overhear you!). Follow the directions in Set Wake-Up Command. It takes you to a new screen and asks you to record your voice saying what you want as your new wake-up command. 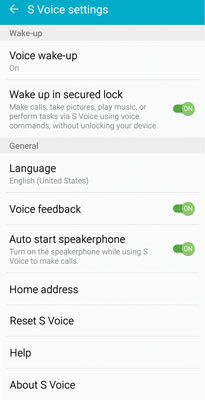 Another option you have is to have S-Voice available even when the screen is locked. That’s right. The phone can be locked up tighter than Fort Knox, but you can get to everything by asking S-Voice to do it for you. If this worries you that someone could impersonate your voice, toggle “Wake up in secured lock” to the off position. Next, you have the choice to have S-Voice feedback from the female voice or not. If you want to get your responses with written pop-ups, toggle this option off. When you make a call using S-Voice, the default setting is for that call to be conducted via speakerphone. This seems logical. If you are talking with your phone via speakerphone, you probably want to talk to your contact via speakerphone. If you prefer to have the call come up with you holding the phone to your ear, toggle this one off. Finally, S-Voice would like to know your home address. That allows you to ask, “Navigate me Home.” This only works if S-Voice knows where home is. Make sense?